South Korean business moguls are expected to start considering potential business projects in North Korea after their Pyongyang trip, according to the industry on Wednesday. According to news reports, the chiefs of the country’s three-biggest family-run conglomerates -- Samsung Electronics Vice Chairman Lee Jae-yong, SK Group Chairman Chey Tae-won, LG Group Chairman Koo Kwang-mo and 14 others -- are expected to hold meetings with top executives on the results of the trip after arriving in Seoul on Thursday. 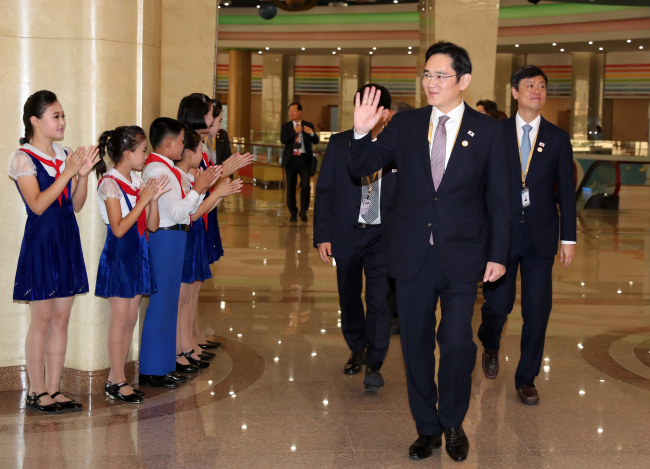 The chaebol chiefs are scheduled to leave Pyongyang after a farewell ceremony on Thursday morning, but their exact departure time had not been confirmed as of Wednesday afternoon. However, the prospects of possible projects in the North appear to have grown slightly more positive in the business community, as the leaders of the two Koreas announced the start of a railroad project and normalization of the Kaesong industrial park in their joint statement. “Businesses will have to think about what they have to prepare for Kim Jong-un’s visit to Seoul soon,” said another industry official, declining to be named.